Lauren Sell, VP of marketing and community services, responds to the most frequent questions heard at the recent Austin Summit. The summit is an amazing place to ask tough questions about OpenStack, so I wanted to take the opportunity to reflect on the five most common questions I heard in Austin along with a few thoughts on each topic. Why was the Foundation promoting containers communities like Kubernetes? Isn’t that competitive? At the Austin Summit, Mark Collier talked about the need to “collaborate or die.” We were deliberately pushing attendees out of their comfort zone to realize that OpenStack alone will not be the future of cloud computing. It’s critical that we become the best integration engine for container orchestration systems, like Kubernetes and Mesos, and platform-as-a-service (PaaS), like Cloud Foundry and OpenShift, to help users build and run cloud-native applications alongside their key business systems. Many OpenStack users like LivePerson, Time Warner Cable and Lithium Technologies are successfully running Kubernetes and Mesos in OpenStack-managed virtual machines (VMs) today, which has allowed them to quickly roll out these services for their internal customers. That setup may satisfy their use cases indefinitely, but there is also the potential to explore new architectures with container orchestration technologies on OpenStack bare metal with Ironic. We can even re-image the entire infrastructure stack to use technologies like Kubernetes in an integrated deployment managing certain OpenStack services as Alex Polvi of CoreOS demonstrated. The main takeaway is that we must embrace and enable new technologies rather than hide away and be bypassed. It’s critical we work closely with adjacent communities like the Cloud Native Computing Foundation, Cloud Foundry and OPNFV to better integrate these technologies and let users lead the way. Together, we’re building the LAMP stack of the cloud. OpenStack technologies play a critical role, but become even more valuable when combined with the right emerging technologies for the right use cases. Why should I care about network functions virtualization (NFV) if I’m not a telecom? Or, is OpenStack “pivoting” to telecom cloud? Telecom providers have gained a strong voice in the OpenStack community over the last two years, starting with Toby Ford’s OpenStack Summit keynote in May 2014, where he challenged the community to be the platform for NFV. Since that time, much work has been done to add features and improve performance for telecom use cases. Externally, it’s caused some confusion, so much that The Register proclaimed OpenStack was “pivoting” to telecom, which is simply not true. OpenStack is a set of general purpose infrastructure services, and any application that needs compute, storage and networking will benefit from them. Telecom is a massive market where we’re seeing a lot of adoption, but we continue to see similar growth across private cloud, university/research and even public clouds (more on that later). Different use cases of course have different requirements and require specialization on top, but ultimately this diversity of use cases benefits the entire community. In fact, Toby Ford and Amit Tank of AT&T gave a talk in Austin about how the NFV use case will be much more pervasive than telecom, and how the work going into OpenStack to support NFV will benefit a broad base of users. Why was Gartner talking about bi-modal IT? We’ve noticed a pretty distinct pattern among OpenStack users. They start with small, focused private deployments or public cloud, often for software development and testing. After finding success, they expand their footprint to run production web and mobile applications and other systems of innovation. Soon, they start to assess legacy applications and how to optimize them for the cloud to realize the same benefits. There was definitely some snark among a segment of attendees at having someone from Gartner speak. I have had my own differences of opinion with some Gartner analysts over the years, but just like OpenStack is not one person or a single viewpoint, Gartner is made up of many analysts covering different areas of the IT market. Scott is an individual within Gartner who has covered private cloud in depth for the past several years, and I appreciate and respect her perspective. During the keynote, I think we failed to fully connect the framework she laid out back to our message about the power of one platform for a diverse set workloads, which may have contributed to that feedback. 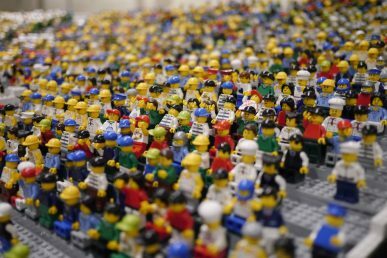 Is OpenStack basically competing with public clouds? Pitting OpenStack private cloud against AWS public cloud is wrong on a couple of levels. On the one hand, it’s a good sign that folks think OpenStack is winning the private cloud race, but on the other hand it means they don’t see OpenStack at the table with public cloud providers. There’s no doubt AWS is massive force in the public cloud market, but in reality it’s a multi-cloud world, and we predict enterprises will be using a variety of clouds: private, hyperscale public and specialized public clouds. Using OpenStack private cloud and AWS is a common use case, as is using OpenStack private cloud + AWS + OpenStack public clouds, or simply OpenStack public + private clouds, and there are many more patterns…all being done today. Some estimates put the global public cloud services market at more than $200 Billion annually, with AWS currently accounting for around $10 Billion. There’s a growing piece of the public market being driven by data sovereignty, vertical industry requirements and trusted business relationships. Two great examples: UK-based OpenStack public cloud provider Datacentred recently signed HMRC (British Tax Authority) as a customer, and City Network, another OpenStack public cloud provider with several datacenters in Europe and North America, recently announced Swedish insurance group Folksam as a customer of their financial services cloud. Internap recently launched its bare metal service, and DreamHost announced general availability of DreamCompute–both OpenStack-powered public compute clouds. In Europe, OVH launched its public cloud services in November 2015 and have spawned 430,000 production instances since March. They also have 75 PB of data in their Swift cluster, and you can see more stats in its six-minute keynote presentation. T-Systems launched the Open Telekom Cloud in March of this year and the Cloud Team Alliance won approval in a lengthy European Commission tinder process. In the Asia Pacific region, service providers including Huawei, Fujitsu, NEC, NTT Data and Telstra join the global ranks of OpenStack cloud provides who are growing the market. Is OpenStack only for big companies with large teams of people who run it themselves? We’ve featured some pretty big users on the OpenStack Summit keynote stage, such as AT&T, Volkswagen and Walmart. 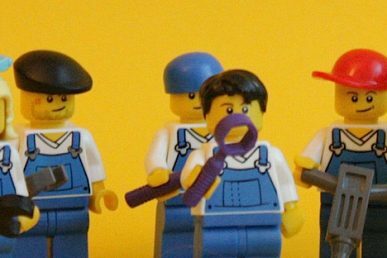 These organizations show that OpenStack is being run today, at scale, and is strategic to these companies who are directly involved in the community. Most of these large-scale users are working with multiple players in the OpenStack ecosystem, as well as employing their own teams of dev/ops engineers. But there are lots of ways to consume OpenStack, and over the last six months we’ve seen dozens of mid-size organizations coming on board. According to the most recent user survey, 43 percent of respondents worked for organizations with less than 999 employees, and 25 percent had less than 99 employees. It’s a result of the maturing technology, ecosystem (more public clouds, managed private clouds and packaged solutions becoming available), and the cloud computing market overall as the economy has ticked up and more organizations realize they need to be agile in order to compete. I mentioned HMRC and Folksam as two examples of these mid-sized organizations that are using public cloud services rather than running their own cloud. We’ve also heard from companies like Burton Snowboards, ViaSat and PubMatic who are running it on their own with small teams. Based on the feedback at the Austin Summit, I think this is an area we need to spotlight more at the Barcelona Summit and beyond with user success stories and metrics. With a community as diverse and global as OpenStack’s, it’s more important than ever to ensure every voice is heard including the tough questions about where we, as a community, should go next. Let’s continue the discussion between summits in our many forums like mailing lists and local events including more than 20 OpenStack Days around the world. 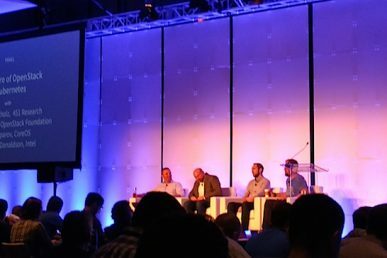 News from the recent Tectonic Summit on how Kubernetes and OpenStack are working together.